Was at this place called 双井where I realise quite a number of Singaporean expats live there. 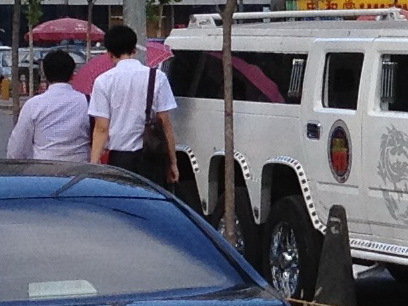 Found this stretched hummer parked outside Carrefour Supermarket. 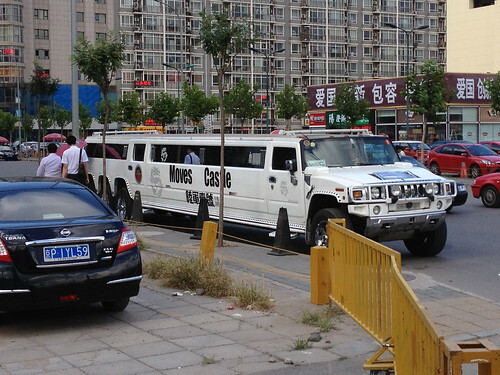 Well, we have all seen stretched limos and the likes overseas and a stretched hummer really isn't something worth putting up as a blog entry. But it is up here coz I saw something funny. If you look at the closeup carefully, you'd notice a pink umbrella. That was the parking Auntie, with the pink umbrella, having trouble figuring out how much to charge this vehicle as it is taking up more than one parking space. You could tell she was very confuse as she was pacing up and down the vehicle. Her "so how ah?" facial expression was priceless. Too bad, I could only manage a quick snap as I was about to cross the traffic light. Alas, there were two people blocking my one and only shot, which otherwise would have made a better picture for telling this story.